You know you need more flexibility at your job in order to be your best self at work as well as in all areas of your life. How can you successfully request flex from your employer? 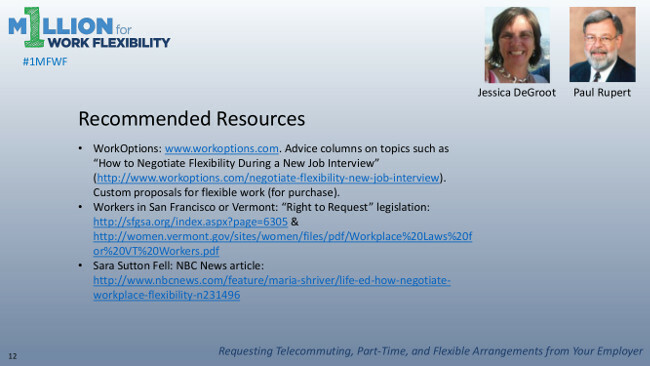 On October 23, we hosted a webinar with panelists Paul Rupert, a pioneer in flexible work and management for 40 years, and Jessica DeGroot, who helps employees follow a “third path” that allows for success at work and at home, to hear their guidance on asking for and achieving work flexibility. The event included a discussion about the components of an effective flex proposal, as well as resources for workers looking for more information on this topic. Please see the relevant slides below. Jessica DeGroot, president and founder of ThirdPath Institute, is passionately committed to helping men and women—as parents and leaders—create an integrated approach to work and life where they have time for work, love, and play! Jessica and the ThirdPath community provide coaching, training, and workbooks to individuals and families looking for new and better ways to balance work and life. In addition, they work with leaders who want to follow integrated career paths—not only does this help leaders create more satisfying solutions, it also helps them become role models for everyone around them. Jessica and ThirdPath have been featured in national print media including The Wall Street Journal, Business Week, Sunday New York Times Magazine, Working Mother and Fast Company, as well as a number of local and regional television and radio shows. Jessica received her MBA from the Wharton School, where she was co-founder of the Wharton Work/Life Roundtable. She has been published in The Harvard Business Review, Sloan Work and Family Encyclopedia, The American Woman 2003-2004, and is co-author of the Wharton Work/Life Resource Guide. Jessica and her husband live in Philadelphia and have always shared in the care of their two (almost now grown!) children. Paul Rupert is President of DC and San Francisco-based Rupert & Company. A flex work pioneer for decades, he perfected the FWA Request Form in use by hundreds of companies and millions of employees in the US and Europe. He used flex schedules to recruit superior staff in a Silicon Valley medical start-up in 1972, and several firms after that. He managed remotely staffed consulting organizations for three decades as Associate Director of New Ways to Work (SF), Flexibility Practice Leader of WFD Consulting (Boston) and President of his firm since 2000. A Stanford graduate, he is considered a flex thought leader and quoted in the media from the Wall Street Journal to NPR.